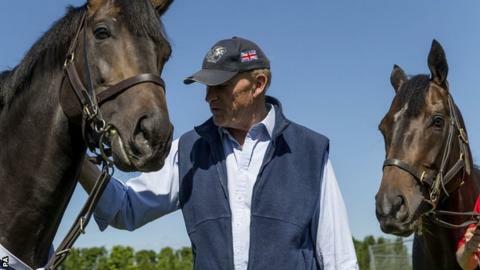 John Gosden, trainer of the unbeaten three-year-old Golden Horn, believes that the brilliant Derby winner's clash with older horses in Ascot's King George VI and Queen Elizabeth Stakes is "the whole essence" of what the high-summer championship race is all about. The colt is seeking to build on his successes in the Dante Stakes and Eclipse Stakes as well as at Epsom. But as he attempts to make it six wins from six career starts, Gosden warns he faces "probably his biggest test so far". Frankie Dettori will once again take the mount on the son of the stallion Cape Cross, owned by his breeder Anthony Oppenheimer. Gosden, who is likely to also run Eagle Top and Romsdal, said: "Golden Horn's been fine since the Eclipse and even progressed physically - he's filled out. "We always thought that he was a good, proper horse, but he just seems that much more streetwise - harder and tougher now." However, he added: "These are proper older horses taking him on, four really smart ones. Don't rule the rest out, don't rule the Italian horse Dylan Mouth out." Golden Horn will be the only member of the Classic-aged generation in a field of up to 10 runners. The field also includes the first three home in Royal Ascot's Hardwicke Stakes - Snow Sky, Eagle Top and Postponed - who are all four-year-olds. Also due in the line-up is the highly talented Flintshire, runner-up to Treve in the Prix de l'Arc de Triomphe. Last year's runner-up Telescope misses the race following a setback. Gosden is twice a King George winner with the three-year-olds Taghrooda in 2014 and Nathaniel (2011). He said: "The clashing of the generations is the whole essence of what this race is all about. The race did go through a stage where it became one dimensional; it was only older horses and small fields. "What grabs you is when the three-year-olds run too." While the trainer is being characteristically diplomatic about Golden Horn's prospects of continuing the winning streak, others are being less so. Luca Cumani, trainer of Postponed, described the race as "in theory, a foregone conclusion". He added: "To me, Golden Horn should win and the rest of us are fighting it out for second."